This book contains the opening words of a New Message from God. In the pages that follow, God is speaking to humanity anew, providing a warning, a blessing and a preparation for the great change that is coming to the world. God has spoken again at a time of great need and difficulty worldwide. This is a Divine answer to the growing crises of war, unrelenting climate change, religious conflict, and human suffering and deprivation now escalating around the world. The New Message from God is a living communication from God to the heart of every man, woman and child on Earth. The Word and the Sound are in the world again. We are living at a time of Revelation. The New Message from God has not entered the world through the existing religious authorities and institutions of today. It has not come to the leaders of religion or to those who garner fame and recognition. Instead, God’s New Message has entered the world as it has always done. It has come quietly, unlooked-for and unannounced, given to a humble man chosen and sent into the world for this one task, to be a Messenger for humanity at this great turning point. Though it appears to be a book in the hand, God Has Spoken Again is something far greater. It is the beginning of a living communication from God to you. In the pages of this book, God’s Presence calls to you and to all people, calling for you to awaken from the dream and the nightmare of living in Separation apart from your Source, calling down through the Ancient Corridors of your mind to the spiritual presence and power that live within you, waiting to be discovered. It is this spiritual presence within you that will confirm the truth and authenticity of God’s New Message. Here the mind may doubt and struggle with the gift and challenge of a New Revelation, but your heart will know. At this deeper level, you will not need convincing—the truth will be apparent to you. Has God spoken again? Is this the Message you have been looking for? Read the words of Revelation in this book and at a deeper level you will know if it is real, honest and pure, even if it is different from what you may currently believe. It is this inner knowing and confirmation that can recall to you the depth and power of your connection to God. What you hold in your hands is a book of Revelation. The words in this text are the direct communication from God, translated into human language by the Angelic Presence that oversees the world, and then spoken through their Messenger Marshall Vian Summers. The New Message from God is the largest Revelation ever given to humanity, given now to a literate world of global communication and growing global awareness. It is not given for one tribe, one nation or one religion alone, but instead to reach the entire world, a world very different from the ancient world of the former Messengers. Never before has there been a Divine Revelation of this depth and magnitude, given by God to all people of the world, in the lifetime of the Messenger. At the center of the New Message from God is the original Voice of Revelation, which has spoken every word of every book of the New Message. Never before has the Voice of Revelation, the Voice that spoke to the Messengers and Prophets of the past, been recorded in its original purity and made available to each person to hear and to experience for themselves. In this way, the Word and the Sound are in the world. The words of this Voice were recorded in audio form, transcribed and are now made available in the texts and audio recordings of the New Message. In this way, the purity of God’s original Message is preserved and given to all people in the world. The Messenger has walked a long and difficult road to bring the New Message from God into the world. The process of Revelation began in 1982 and continues to this day. At this time, the Messenger is engaged in compiling over three decades of spoken Revelation into a final and complete text form. The New Message will ultimately be contained in six volumes and possibly more. Each volume will contain two or more books, and each book will be organized into chapters and verses. Therefore, the New Message from God will be structured in the following way: Volume > Book > Chapter > Verse. 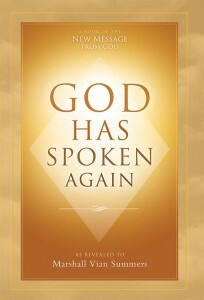 God Has Spoken Again is Book 1 contained in Volume 1 of the New Message from God. Therefore, this text contains the opening words of God’s New Message and stands as the first book in the growing library of the New Revelation. 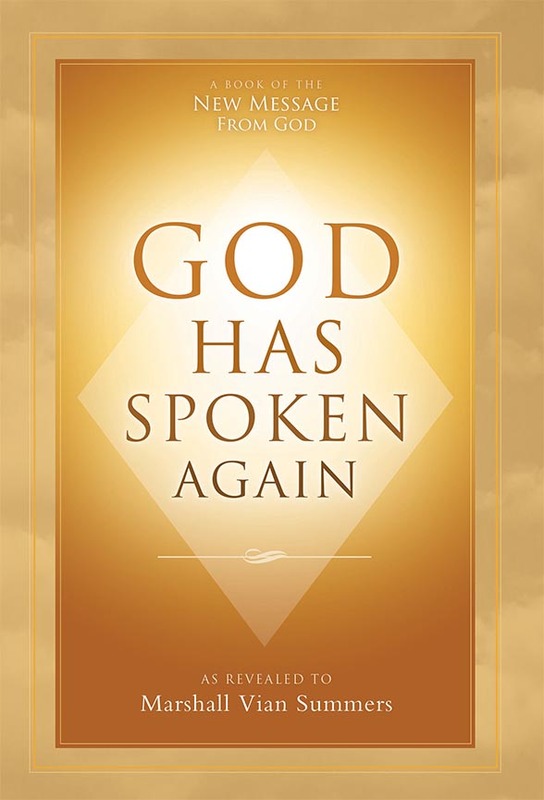 God Has Spoken Again contains 14 individual revelations, compiled into this book by the Messenger. With this, the reader should understand that this book is not a series of chapters delivered in sequence, but instead is a compilation of individual spoken revelations given at different times and places. In some instances, the Messenger has inserted a word not originally spoken in the Revelation. When present, this inserted word will be found [in brackets.] Consider these bracketed insertions as direct clarifications by the Messenger, placed in the text by him alone in order to ensure that ambiguities in the spoken communication do not cause confusion or incorrect interpretations of the text. In some cases, the Messenger has removed a word to aid the readability of the text. This was usually done in the case of certain conjunctions (such as the words and, but) that made the text awkward or grammatically incorrect. The text of this book has been structured by the Messenger into verse. Each verse roughly signals the beginning or ending of a distinct topic or message point communicated by the Source. The rendering of this text is according to the Messenger’s original will and intention. Here we are privileged to witness the process of compilation being undertaken by the Messenger, in his own time, by his own hands. This stands in contrast to the fact that the former great traditions were not put into written form by their Messengers, leaving the original Revelations vulnerable to alteration and corruption over time. Here the Messenger seals in purity the texts of God’s New Message and gives them to you, to the world and to all people in the future. Whether this book is opened today or 500 years from now, God’s original communication will speak from these pages with the same intimacy, purity and power as on the day it was spoken. God Has Spoken Again is the beginning of a living communication from God to humanity. The chapters of this book are like breaths in that communication. Here, God is calling to humanity; calling across the world into every nation, culture and faith community; calling into the halls of government and religion; calling into the darkest places where inner suffering and physical deprivation are deepest; calling for the spiritual power of humanity to emerge and for humanity to unite and cooperate sufficiently to prepare for the great challenges ahead. Remarkably you have found the New Message from God, or it has found you. It is no coincidence that this is the case. God is calling now across the world and this calling has found you. Here opens the next chapter in the mystery of your life and of your presence in the world at this time. The door opens before you. You need only enter to begin. As you enter more deeply into the Revelation, the impact on your life will grow, bringing a greater experience of clarity, inner certainty and true direction to your life. In time, your questions will be answered as you find growing freedom from self-doubt, inner conflict and the restraints of the past. This is the Power of Heaven speaking to you directly, revealing to you the greater life that you were always destined to live.